PalmSHIELD has a complete set of specifications and CAD drawings for our PalmSHIELD Square Mesh Panel System. This information will make it easy for engineers and architects to provide a complete set of specifications for square mesh panel systems. 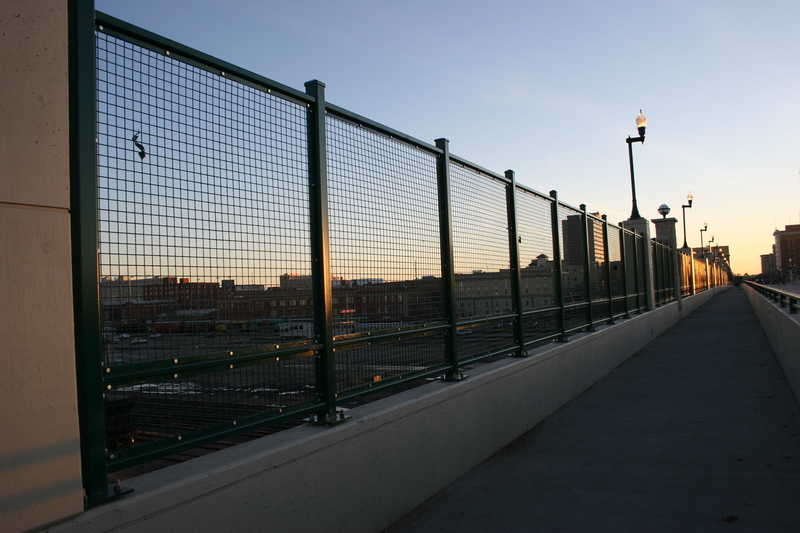 This is the only complete square mesh panel specification that provides both square mesh specifications and supporting framework, posts and gate information. This system incorporates our proven PalmSHIELD fully framed panels, engineered plated posts, our gorilla hinges and internal gate lock system. Woven wire mesh is made in a similar means to woven fabrics. Wires are woven together to create wire mesh in different patterns. Welded wire mesh simply lays the vertical wires over the top of the horizontal wires and use a welding process that fuses the two wires together. The most common materials used to create woven wire and welded wire mesh include carbon steel, galvanized steel, aluminum mesh and stainless steel. Heavier woven wires must be pre-crimped. The material remains very strong and firm after the crimping process.